Before I get started does anyone want to explain themselves for not following my post-week 2 advice and picking up Larry Donnell? Well don’t bother because now the whole world knows who he is after his 3 touchdown game last Thursday against Washington. He’s established himself as a TE1 in most leagues and has a an opportunity to put up some truly gaudy numbers in this offense as the primary red zone target. I want to take a minute (Or seven?) and talk about one of my favorite quarterbacks in the NFL: Eli Manning. You have every reason to tune out here but if you stick with me I might be able to convince you why he’s a better option than some of the starting quarterbacks you currently have on your roster. I’m going to get flack for ranking Eli Manning 12th, which was the highest ranking of the six lists and four spots higher than his average ranking (16). Listen, people can look at the 27 interceptions and his struggles from last year and say “well that’s who he is.” But that isn’t who he is, he’s (usually) a top-10 quarterback playing for a team that has no business being in the conversations he has put them in. 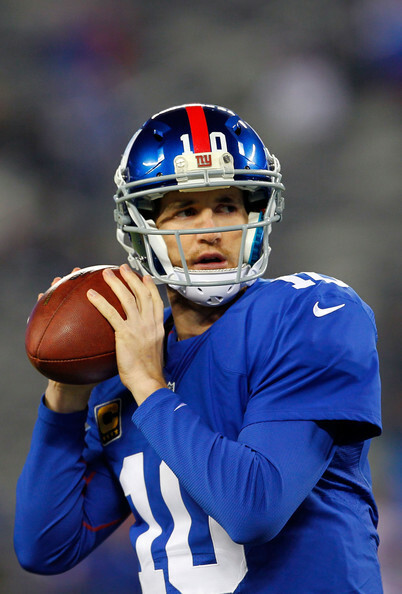 Very few people noticed that after that dreadful start (0-6) he helped the Giants finish the season (7-3) and completed over 60% of his passes. He did all that with his top three running backs non-existent and, essentially, one weapon healthy (Victor Cruz). This isn’t a situation like the Jets, Eli has (dare I say it) better physical tools than his brother with a quarter of the personnel Peyton has had in his career. We are going to discuss this more during our Podcasts but I expect Eli to get right back to it in 2014. A huge reason for my optimism was the hiring of former Packers quarterback coach, Ben McAdoo, as the new offensive coordinator. Everything he brings to New York (lots of no huddle, quick routes, getting rid of the ball quickly) fit Eli’s strengths perfectly. I’m one of the rare birds writing who follows college football just as close and can say that the things McAdoo brings Eli has been doing without a hitch since his days at Ole Miss. So what does this mean for fantasy owners? I also said he needed to get his feet wet before you counted on him as “The Guy.” Hope you listened. If I was wrong about something it was that Forsett seems to still have a large role in the backfield ahead of Taliaferro. He still carried the ball 15 times (to Forsett’s 14) and averaged almost four yards per carry. Hasn’t connected in the end zone yet but looks like a solid young passer. Injury concerns already cropping up but looks to have a bright future if he can stay on the field.